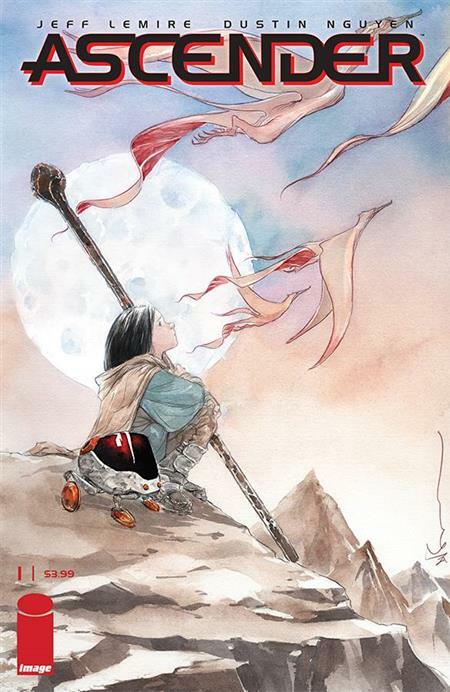 'THE HAUNTED GALAXY,' Part One Powerhouse creative team JEFF LEMIRE and DUSTIN NGUYEN launch an all-new sequel series to DESCENDER with the launch of ASCENDER! Set ten years after the conclusion of DESCENDER's storyline, magic has taken the place of machinery and the rules are very different indeed… Mila, the daughter of Andy and Effie from DESCENDER, spends her days exploring the lonely wilds of the planet Sampson and trying to stay out of the clutches of the evil disciples of the all-powerful vampire witch known only as Mother. But, like her parents, Mila doesn't like to play by the rules, and when a certain robot pal of her dad's shows up, nothing will ever be the same! With all the scope and heart of the sci-fi classic DESCENDER, LEMIRE and NGUYEN reunite to take readers on an unforgettable fantasy quest!